BAseball Reality Tour: Why Don't You Arbitrate Deeeze? Most people around the Cubs know that they prefer to settle arbitration cases than have a hearing. As fans, I think we mostly like that. Arbitration cases have a likelihood of creating bad feelings between the player and club as the team tries to tear down a player’s accomplishments and points out their flaws in order to win the case. For 17 years, the Cubs had famously not taken anyone to arbitration until last offseason with Ryan Theriot. The Riot is in the Dodgers system now, so let’s take a look at this season’s arbitration guys for the Cubs. We hope this provides a unique preview for the hot stove league, since the Hot Stove is the only league the Cubs have a chance to win in the next few years. 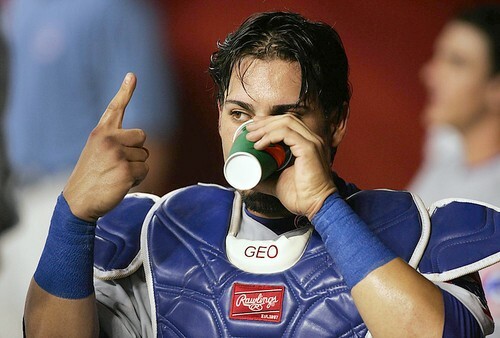 The Cubs have Geovany Soto as the lone player eligible for the first time, six players* who are up for their 2nd time, and no players going into their 3rd year of arbitration. *the six players are, as we’ll see in a moment: Carlos Marmol, Jeff Baker, Sean Marshall, Angel Guzman, Tom Gorzelanny, and Koyie Hill. Micah Hoffpauir, Blake DeWitt, and Randy Wells fall just short of the service time to qualify for their first year of arbitration. So, they are under team control at a cheap rate again in 2011, if the Cubs choose to keep each of them on the 25-man roster. Let’s try to value the seven players the Cubs have arbitration decisions to make with, in order to try and predict how things will play out. Geovany Soto has been a strikes and gutters kind of player. He won rookie of the year in 2008, was terrible in his sophomore slump season last year*, and rebounded for a fine season this year. We’re not too worried about the shoulder injury that has knocked him out for the rest of the year. It sounded like his surgery was merely a tune-up to repair his AC joint, which had been bothering him for a few months. In other words, the Cubs’ season had ended long before his “season-ending” surgery. *How can we ever forget the way he and Matt Forte were linked, when the latter's sophomore slump season immediately followed the former and Bear fans started calling their starting running back Geovany Forte? Speaking of name combinations. How great would Geovany Gorzelanny be? *Some places use $4mm, others $4.5mm. It’s a free country. **Two weeks ago, this post mentioned how we will use avWAR, the mean between Fangraphs and Baseball-Reference figures. The general rule of thumb for figuring arbitration pay is that first year arbitration eligible players earn roughly 40% of their “value”, second year arb guys earn 60%, and third year guys earn 80% of their supposed value. I’m not sure if people only look at the last season’s performance. They may, but I think that would be short-sighted and irresponsible. 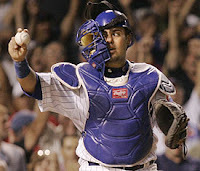 40% of Soto’s 2010 performance equates to a 2011 salary of $5,695,000. If we average the three year’s performance value and calculate 40% of that, it comes to a 2011 salary of $4,590,000. 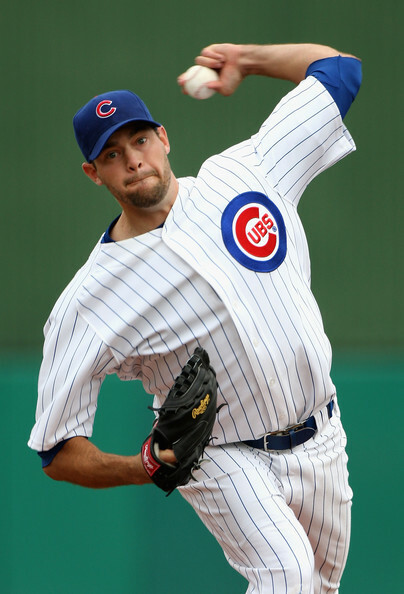 Ultimately, the Cubs could decide to sign Soto to a three or four year deal, but the risk is that he will become an out of shape albatross who closer resembles the 2009 Soto than the even-year Soto. I feel like they will either settle on a 2011 salary around $6 million or look at a three year deal around $13 million or a four year deal around $20 million. Second-year cases for the Cubs look a bit simpler. First off, they will likely non-tender Jeff Baker, Koyie Hill, and Angel Guzman. Of those three, I think Koyie Hill still has a slim chance to return as Soto’s backup catcher. 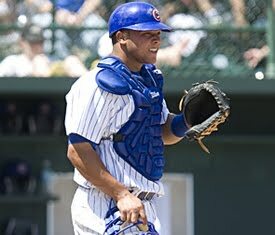 The Cubs have a 23-year old catcher, Welington Castillo, who’s been in the farm system for five years and slugged .498 in Triple A this season. "Castillo's my name, beisbol's my game"
Koyie Hill, on the other hand, hasn' been able to consistently hit a lick. Although defensive statistics are controversial, and catcher is the most difficult position to rate, the scouting eye says Hill is a very good defensive catcher. A rarely discussed statistic also supports Hill's value to the club, as the team’s win-loss record with Hill behind the plate is what originally endeared him to Lou Piniella, Jim Hendry, and many fans. Welington Castillo is probably not as skilled as Hill behind the plate, but his throwing arm is supposed to be a strength. I think I’d be happier with a low-cost, 23-year old, backup, slugging catcher with a good arm and some pop than a no-hit, good-glove backstop making double the salary. While I don’t think anyone else is running to sign Hill and his career OPS+ of 50, he should be an MLB backup backstop somewhere next season. If Castillo has a less than impressive final fortnight with the Cubs, I could see Hill still get non-tendered, with the Cubs then offering him something like a one-year deal at $800,000 or a two-year $1.4 million deal to stick around through 2012. That being said, it’s probably foolish to put too much stock into these next two weeks, where Castillo may only play a handful of games. 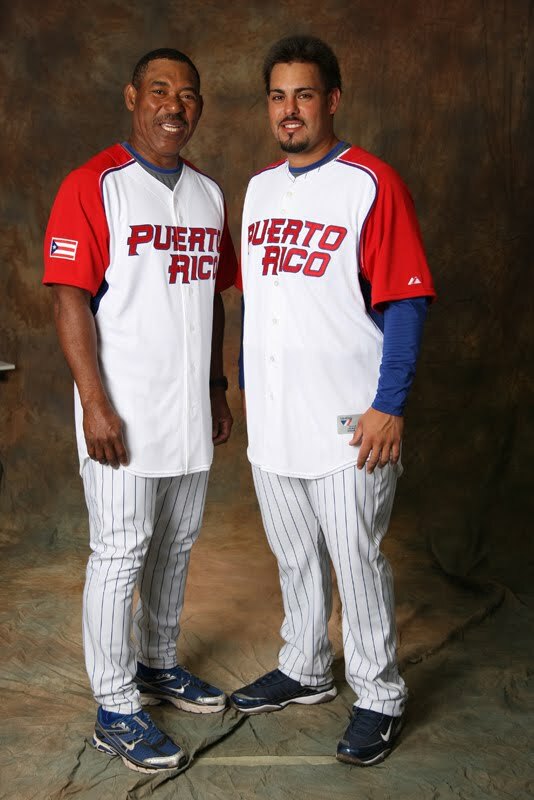 Ryne Sandberg, the Pacific Coast League Manager of the year and a leading candidate for Cubs post next season, managed Castillo the past three years. If Ryno gets the job, we’ll know right away how he feels about Castillo. Two lefty pitchers, Tom Gorzelanny and Sean Marshall, will likely get tendered and receive nice bumps in salary. Using math similar to our method of guesstimating Soto’s contact, we found one-year deals for 2011 for these guys should be around $4,250,000 for Tom Gorzelanny and $4,250,000 close to $4mm for Sean Marshall. We feel it would be wise for the Cubs to lock up either of these guys to modest 3-year contracts before their values increase from an optimistic, yet foreseeable good seasons in 2011. A 3-year, $12 million contract for either or both of these guys could be warranted. 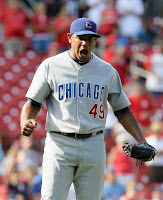 The largest contract of the remaining players will go to Cubs’ bat-missing closer Carlos Marmol. He’s been effectively wild most of the time, walking 6 batters and striking out over 15.6 per 9 innings. Quickly, here is an illustration of the strikeout capabilities a couple of guys in the Cubs bullpen have shown from both sides of the rubber this season. The list looks quite different when you change the minimum innings pitched requirement. Marmol’s season has been remarkable. Even if you drop the innings pitched requirement to 20, Marmol still leads all Major Leaguers in K/9. He has given up only 1 homerun all season, and that was back on May 15th. The Cubs were down one run in the top of the ninth, when he gave up a solo shot to the Pirates’ Jeff Clement. Over four months later, Marmol has not given up any more homers. Carlos Marmol has been almost unhittable, with a remarkable .162 Batting Average Against. That figure leads all pitchers (min 70 ip) by a lot; Jonny Venters and Evan Meek place second with a .194 BAA. Interestingly, if you lower the ip requirement to 60, Billy Wagner sneaks into the top spot at .161, and Daniel Bard is third at .177. We could go on and on about how great Marmol is, particularly that slider (16.4 runs above average), but there are more important things to be doing – particularly by you, the reader. How crazy is good crazy? Crunching some numbers for Carlos Marmol make me feel like he’s about to out earn his true value to the team. We find that a one-year deal for 2011 will probably be around $6 million for Marmol, and it will continue to rise as he continues to get 30+ saves each year. 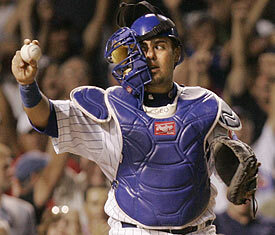 It’s sad because he’s probably been my favorite Cub since 2007. I just believe strongly that BIG closer dollars should be spread around an organization and closers can be found and groomed from young, inexpensive power arms. We say “Don’t pay for saves” in fantasy baseball, and echo the sentiments for teams actually competing in reality. Marmol, after all, was a converted third baseman who couldn't hit and had a very strong arm. Too bad Hendry can’t pick up his cell phone and deal for a miracle, since that’s what the Cubs will need to compete in October anytime in the next two or three seasons.